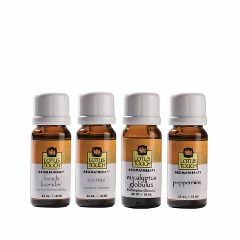 Our 4 most popular, therapeutic grade, single note oils in one convenient pack. Includes (4) 10ml oils including NEW French Lavender, Eucalyptus Globulus, Tea Tree and Peppermint. Oils are full strength, no dilution or additives. See our website to learn more about these oils and their suggested uses.